British writer Pat Mills is the man behind some of the most famous creations in the field of comic books, including such classic stories as ‘Charley’s War’ (1979 – 1985), ‘The ABC Warriors’ (1979 – 2010), ‘Nemesis the Warlock’ (1980 – 1999) and ‘Requiem Chevalier Vampire’ (2000 – 2010). However, one of his most popular series is ‘Sláine’ (1983 – 2009), the tale of the proto-Celtic warrior and king-to-be, Sláine Mac Roth. Drawing heavily upon Irish and Celtic mythology, with elements of Robert E. Howard’s ‘Conan the Barbarian’ (itself of Irish antecedence) and modern mysticism (leylines, Earth powers, witchcraft, etc. ), the story initially told of a wandering ‘sword for hire’, Sláine, in an early post-Glacial western Europe that is known to its peoples as Tir Nan Og (taken from one of the late names for the Irish Otherworld, Tír na nÓg ‘Land of the Young’). Accompanied by his unscrupulous dwarf companion, Ukko (borrowed from Finnish mythology, and the folkloric dwarfs of Scandinavian legend), he travelled the land undergoing numerous adventures in a typical Heroic Fantasy style, until the story later evolved into a far more elaborate narrative far beyond the fairly simple ‘barbarian’ tales of the early adventures. In the first series, ‘Sláine: Warrior’s Dawn’, it was explained that Sláine was banished from his tribe, the Sessair (from the Irish Mythological female character, Ceasair), because of an illicit love affair with his king’s bride-to-be, Niamh (an Otherworld woman in Irish literature). The Sessair were one of the ‘Tribes of the Goddess’ (a near translation of the divine race in Irish Mythology, the Tuatha Dé Danann ‘Peoples of the Goddess Danann’) who inhabited what is now the modern Celtic Isles (Ireland and Britain) and were a sort of ancestor to the historical Celts of Europe. Sláine’s ensuing adventures in exile ranged from fighting dinosaur-like monsters and bandits, rescuing a maiden called Medb (the Irish mythological sovereignty goddess and queen, Méabh) who was being sacrificed to a god, Crom Cruach, by her master the evil ‘Drune-lord’ Slough Feg, to battling the flying ships of the sky-pirates (borrowed from the legend of the coming of the Tuatha Dé Danann to Ireland). This early series was noteworthy for the high quality, if very divergent, drawing styles of artists Massimo Belardinelli and Mike McMahon. McMahon in particular defined for many the look and feel of the ‘Sláine’ adventures of the early 1980s, with a primitive, choppy, pen technique that seemed to bring the series alive, injecting it with an almost primal strength and vigor. In the second series, ‘Sláine: Time Killer’ the story soon expanded well beyond the simple ‘sword and muscle’ conventions of the earlier tales of the sequence as Mills took inspiration from the occult writings and invented mythologies of the Dark Fantasy author H.P. Lovecraft, with a new range of demonic opponents that bore some resemblance to the dangerous, amoral gods of Lovecraft’s ‘Cthulhu Mythos’, and which Mills called the Cythrons. Sláine and his companions soon found themselves in an adventure that crossed time and dimensions, taking the series into a whole new sphere of importance, and introducing the ‘Atlanteans’ into the mix with numerous side-references to the pre-history of Europe. Again, different illustrators contributed to this second series exhibiting varied styles and takes on the stories and characters, with Glen Fabry standing out for his skill and attention to detail, becoming one of the defining ‘Sláine’ artists of the mid and late 1980s. In ‘Sláine: The King’, which continued the excellent art of Fabry (with some lesser offerings from Mike Collins and David Pugh), Sláine, having defeated the Cythrons, returned triumphantly to his tribe, the Sessair, only to find that they had become slaves of a demonic race of sea-dwelling beings, the Fomorians (borrowed from the Fomhóraigh, the demonic race of Irish Mythological tradition and enemies of the divine race, the Tuatha Dé Danann). The story, in terms of writing, continued Mills high standard and readers loved it. 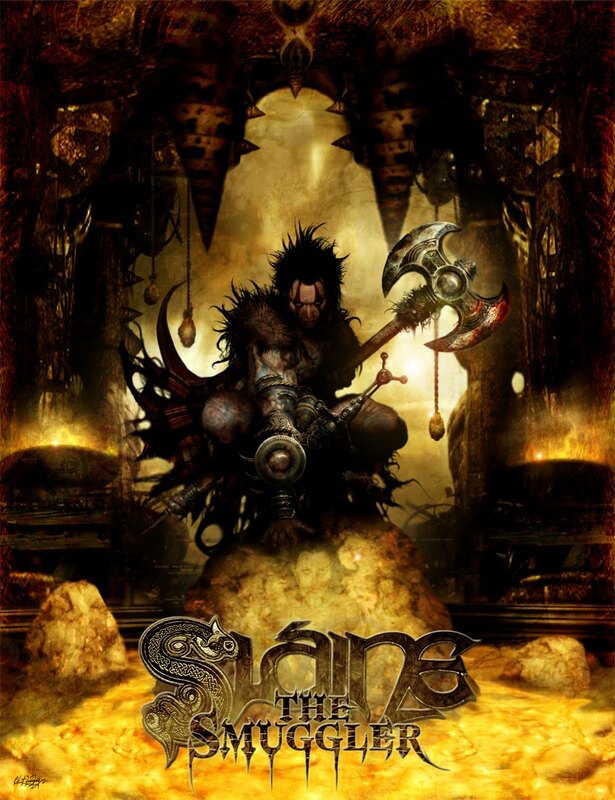 With ‘Sláine: The Horned God’ the series, in illustrative terms, took a huge leap forward, with fantastic, full-colour artwork from artist Simon Bisley, while in the story itself Sláine united the four kings of Tir Nan Og and used their mystical weapons against his old enemy, Slough Feg, who planned to destroy the Tribes of the Goddess. However some noted a certain lack of consistency in the writing, as if Mills was becoming more and more enamored by the faux spiritual elements of the story, placing them before drama and narrative pacing. In ‘Sláine: Demon Killer’ several old and new artists featured, including a welcome return of Glenn Fabry, but the somewhat jarring styles took away from the visual continuity of the story. The plot itself centred on Sláine being summoned by the Earth Goddess to travel forward through time to other eras in European history to defend the Celtic peoples from various enemies, including from Caesar’s Roman legions. Somewhat less successful than the other tales in the series, the story included even greater elements of modern mysticism, informed by the works of Marija Gimbutas, Robert Graves and others which left it looking somewhat tired and unconvincing. ‘Sláine: The Books of Invasions: Vol. 1’ , was something of a return to form after a long break of many years, with a lengthy narrative broken up into three parts that managed remarkable consistency. With the Fomorians attacking Tir Nan Og, Sláine was called upon again to defend it, making for a lengthy and complex tale. Experimental artist Clint Langley took over the reins as illustrator, shocking many with his combination of traditional drawing techniques with photography and computer-aided digital effects, to produce some of the most astonishing ‘photo-realistic’ imagery ever to grace the pages of a comic book. For many these issues of the comic 2000AD became collectors editions due to the impact of the artwork. ‘Sláine: The Books of Invasions: Vol. 2’ continued the epic battle between the Fomorians and the Tribes of the Goddess but an unexpected ally emerged to help Sláine and his people, the Atlanteans who originally featured in the second series, back in the mid 1980s. Again, this second part of the ‘Book of Invasions’ was remarkable for Langley’s illustrations, which grew ever bolder and more skilled. In the final part of the story, ‘Sláine: The Books of Invasions: Vol. 3’, the Fomorians besieging the city of Tara (the ancient royal and scared capital of Ireland, Teamhair), were faced by the combined armies of the Tribes of the Goddess under Sláine. The series ended with Sláine leading the Tribes into the Otherworld, leaving Ireland to the Atlanteans who were to become the Irish (inspired by one of the central stories of Irish Mythology, when the divine community of the Tuatha Dé Danann retire to the Otherworld, leaving Ireland to the possession of the Clanna Mhíle, i.e. the Irish). Thus the ‘Sláine’ cycle came to an end, but with a promise of, perhaps, more to follow. The story of ‘Sláine’ remains one the greatest ‘Heroic’ comic book fantasies of modern times, and certainly one of the most influential. The individuals parts have featured some of the best names in the comics industry, both artists and letterers, and has established Pat Mills as a writer of considerable power and imagination. With the addition of illustrator Clint Langley, the series has placed itself at the head of innovative digital art techniques and design in comics, that has yet to be equaled by any other publication. The popularity of the series is reflected in the numerous graphic novels that have been created from the individual comic strips that have appeared over the last three decades. It has also shown the power of the Irish and Celtic literary tradition, and how it has been constantly reinterpreted and reinvented to suit many different stylistic forms, whether it in fiction, art or even comic books. Do yourself a favour and read it. For any self-respecting comics fan it is a joy. For any self-respecting Celt it is a must.